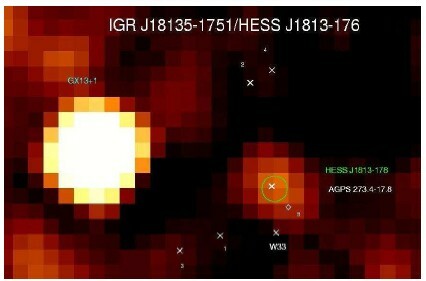 The new TeV gamma-ray source HESS J1813-178 and its surrounding field. The inset illustrates the H.E.S.S. "beam size" governed both by the experimental resolution and a certain amount of smoothing applied to the image. The white contours show the smoothed X-ray count map obtained by the ASCA satellite and the black contours show 20 cm radio emission as observed by the VLA (Brogan et al. 2005). In the survey of the central region of the Milky Way with the H.E.S.S. telescopes (Aharonian et al., 2005, see also here), eight previously unknown sources of very high energy gamma rays were discovered. For two of these sources, HESS J1813-178 and HESS J1614-518, no counterparts in other wavelength regimes were found in the literature. In many sources of high-energy radiation, gamma ray production is related to the acceleration of electrons to high energies. These electrons will emit synchrotron X-rays and radio waves. A source not visible in X-rays or radio could either be a proton accelerator, or be immersed in a rather small magnetic field, reducing losses by synchrotron radiation. Previously, two sources of VHE gamma rays without counterpart were known, the HEGRA-discovered TeV J2032+4130 and HESS J1303-631 . HESS J1813-178 is located within a fraction of a degree from the Galactic plane and is slightly extended, with about 2' (rms) size (Fig. 1). Therefore, it is most probably a Galactic object. The flux of VHE gamma rays is about 6% of the flux from the Crab nebula, the energy spectrum extends to multi-TeV energies. hortly after the discovery of HESS J1813-178 was published, counterparts were located in existing but unpublished multiwavelength data. 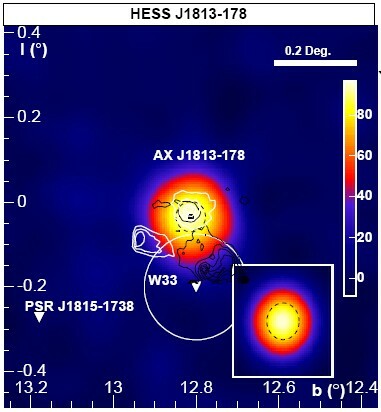 At the location of HESS J1813-178, X-ray emission is seen in ASCA data (Brogan et al. 2005, Ubertini et al. 2005). The ASCA source is termed AX J1813-178 or also AGPS273.4-17.8, the latter referring to the ASCA scan of the Galactic plane. In radio data, both Brogan et al. (2005) and Helfand et al. (2005) (Fig. 2) located a shell-type supernova remnant where a section of the shell coincides with the gamma-ray source. Finally, data from the INTEGRAL satellite (Ubertini et al. 2005) show in the 20-100 keV range a soft gamma-ray source at the same location (Fig. 3). The distance to the supernova shell is estimated to more than 4 kpc (Brogan et al. 2005), from the size of the shell they estimate an age between 285 and 2500 years. Based on the available data, it is hard to identity the exact source mechanism - particle acceleration in the supernova shock wave as in RXJ 1713.7-3946, or emission from a pulsar wind nebula such as MSH 15-52 or the Crab Nebula. Ubertini et al. (2005) also speculate about a possible binary system in analogy to the PSR B1259-63/SS2883 system. In either case, HESS J1813-178 is clearly a more or less "classical" TeV source, rather than a "dark accelerator", as initially thought. Fig. 1: Angular distribution of VHE gamma rays relative to the fitted source position. 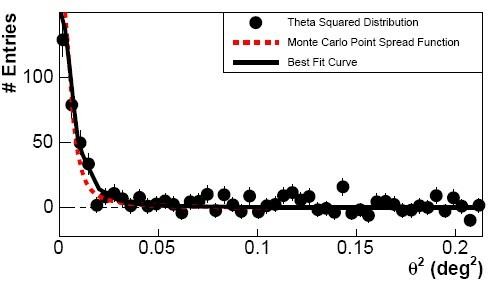 The red dashed line indicates the experimental resolution, the full black line the best fit obtained for an intrinsic source size of 2' rms. Fig. 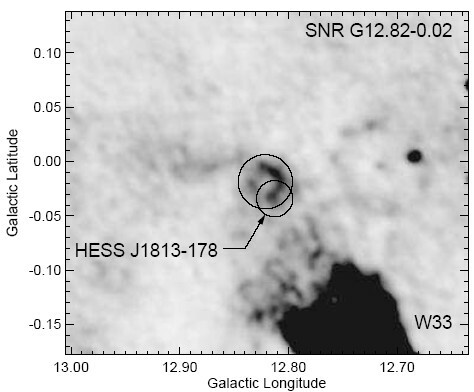 2: VLA 20 cm radio image of the region of the TeV source HESS J1813-178, showing the TeV source location and the newly discovered supernova remnant G18.82-0.02 (larger circle). The bright HII region W33 is seen at the lower right. From Helfand et al. (2005). Fig. 3: INTEGRAL 20-100 keV soft gamma-ray image of the source region, with the strong source IGE J18135-1751 and a fainter source coincident with the TeV source, which is indicated as a green circle. From Ubertini et al. (2005).